David and Serena Pincus accept horses for schooling on a long or short term basis. The full sized outdoor arena with mirrors makes a perfect classroom for your horse and the large indoor school ensures that training can continue in all weather. Please see the Facilities page for more information about our facilities for horse and rider. Horses placed at Sheepcote for schooling will be ridden by David or by a competent member of the Sheepcote staff, under David's direct supervision. We encourage you to participate in the training of your horse and clients are always welcome to visit Sheepcote and watch the horses being ridden. We recommend that you receive tuition on your horse before returning home in order to understand the work being done and to maximise the benefit of the schooling. As well as being an accomplished rider David is also highly experienced in the art of working horses from the ground and in-hand. This type of work can be extremely beneficial and is particularly useful as a means of establishing communication between horse and trainer and to develop collection. Work in-hand is always carried out by David and may be included in the training programme if it's appropriate for your horse. Further information about working horses in-hand can be found on the Media Archive page (article 'From the Ground Up'). 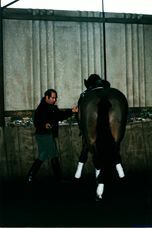 The training methods taught by David and Serena are derived from their extensive experience gained whilst working and training in Europe, including notable locations such as the Spanish Riding School, the Cadre Noir, Warendorf and the establishment of the Dr Reiner Klimke. 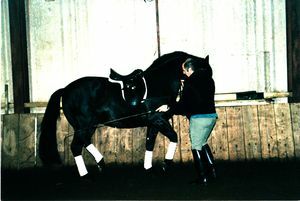 Their training methods are sympathetic and consider the welfare of the horse to be paramount. More information about David's riding career can be found on the About Us page.